Which applications are best for scaling a business from a tiny startup to an enterprise powerhouse? And how do you get your employees to use them? For most companies, success will come from adopting the easiest tools to use, and those which employees are already used to. At GigaOM’s Net:Work conference on Thursday, executives from HIGEAR and Spiceworks discussed why startups tend to collaborate better than their enterprise brethren. The short answer is that they’re smaller, which means they’re more likely to know each other. “I don’t think humans are wired to deal with large groups of people,” HIGEAR President Murtaza Hussain said at the conference. HIGEAR currently numbers about 10 employees. As for the tools they use — when it comes time to pick an application, the best advice is to adopt those which are easiest to use. 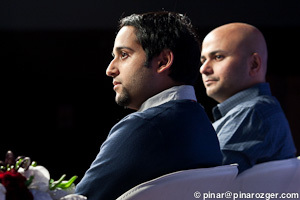 Hussain said that HIGEAR leans heavily on Skype for chat and messaging, and employees tend to use Google (s GOOG) docs. Why? Because they fit the lowest common denominator for access and usage. Few organizations have success when a senior-level executive decides which tools or applications are best. Hussain said the industry is full of examples where a C-level executive feels that one particular piece software is great and pushes it down to the rest of the company to use. “The last thing people want to want to do is learn a new piece of software,” he said. But one potential drawback to that strategy is that letting employees pick their own tools can relate in data silos across an organization, according to Spiceworks VP of Products Tabrez Syed.